Celebrate the rich history of American quilting with some free quilt designs that are sure to challenge and inspire you. There are familiar techniques and small vintage quilt patterns that make sure even your smallest applique quilt designs and quilt borders look their best. 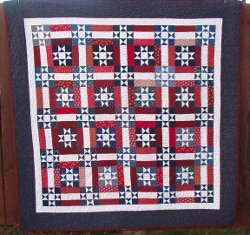 We've also got a few patriotic quilt patterns that use classic favorites like rail fence quilt patterns and star quilts to allow you to represent your pride for a special occasion. Lastly, there are classic American quilt patterns that provide some of the best tutorials for classical American quilting favorites like log cabin quilt patterns. Download American Quilting Traditions: 11 Free Quilt Designs, Quilt Blocks, and More Americana for free today! We wanted to explore more than just special occasion quilts for our latest eBook. American Quilting Traditions: 11 Free Quilt Designs, Quilt Blocks, and More Americana begins by introducing two familiar techniques that you'll most likely see in many future quilt patterns. Not only will you get experience working on the techniques themselves, but you'll also learn how you can put some unique twists on them. If you're ever in need of a quick and pretty way to embellish a quilt pattern of any size, look no further than the Dresden plate. It's easy to piece together, and as you will see with this Dresden plate pattern in particular, you'll learn how you can make it even more unique. The tutorial for "Flower Petal Dresden Plates" (p. 7) modifies the look of the traditional Americana style Dresden plate by brilliantly adding little petal-shaped pieces of fabric. All skill levels will really value this pattern's creativity and clarity. You may even be inspired to start making your own variations. The other pattern included in this section takes from the Native American tradition of quilting with a Seminole-style quilt border. Quilters who have never learned about Native American designs within Americana art need to take a look at this tutorial. Piecing together the "Seminole Patchwork Diamond Border" (p. 5) will be using strip quilt piecing to combine a quaint diamond pattern that will add a quaint pop to your quilt. 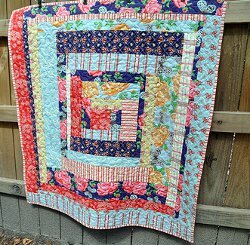 American Quilting Traditions: 11 Free Quilt Designs, Quilt Blocks, and More Americana wouldn't be complete without some vintage quilt patterns that will give your next pattern a recognizably old fashioned look that are sure to impress. You may be surprised to find out that some of these patterns have so much history within the American quilting tradition. Take for example the "Crazy Basket Quilt Block" (p. 12), which represents a popular style from the Victorian Era. Use your scrappy quilt pieces to put together a very unique basket quilt block pattern. To take a step slightly further in time, you can make the "Vintage Flower Mug Rug" (p. 16), which utilizes the charming 1930s style of making flower applique quilts to design charming mug rugs with a seasonal appeal. You'll be learning about a lot of the different sides to Americana with American quilt patterns like the "Amish Bar Mug Rug Pattern" (p. 10), which demonstrates the combination of simplicity and geometry within some Amish quilting. Such a straightforward design will be appropriate for many styles of home decor, so make a whole pile of these to set on your tables. Get your free copy of American Quilting Traditions: 11 Free Quilt Designs, Quilt Blocks, and More Americana for free today! When you get to this first section of full patterns in American Quilting Traditions: 11 Free Quilt Designs, Quilt Blocks, and More Americana, you'll find 3 different, but all traditional quilt patterns that made waves in American quilting. One such kind of quilt is the log cabin quilt pattern, the "Country Cabin Lap Quilt" (p. 29). Make your first traditional quilt with refreshing fabrics in that pieced together style that quilters have fallen in love with again and again. You may learn a thing or two from this eBook. For instance, did you know that stacked coin quilt patterns were popular during the Civil War? 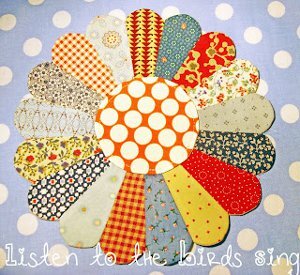 You'll find out why when you make the "Old Money Quilt" (p. 28), which can easily be updated with your fabric choices. We also made sure to include a popular star quilt pattern, the "Golden Hunter's Star Quilt" (p. 24), which demonstrates the beauty of the sharp and distinct hunter's star. Choosing which American quilt style you'd like to start with will be tricky, but each of these full patterns will be easy to follow, and you'll have your own classic quilt in no time. American Quilting Traditions: 11 Free Quilt Designs, Quilt Blocks, and More Americana is not solely dedicated to patriotic quilts, but we just couldn't complete it without them! Dress up your home before your next holiday or just enjoy a colorful mix of reds, whites, and blues used within some of your favorite quilting designs. You can always save these patterns for later and revamp them with your own color schemes. Star quilts appear again in this eBook with the "Ohio Stars and Rails Quilt" (p. 35), which effectively combines star quilt block patterns with rail fence quilt blocks for a clean and consistent pattern that catches the eye with it's playful geometry. If you prefer stripes to stars, you should definitely take a look at the "American Rails Quilt" (p. 33), which further explores the dynamic patterning involved in rail fence quilts. The blocks are easy to put together, making the overall design, though seemingly tricky, to come together flawlessly. These American quilts aren't just meant to be laps and throws. There are smaller patterns such as the "Americana Diamonds Doll Quilt" (p. 38), which guides you through making a pretty mini quilt that can be hung on the wall, stretched across a table, or given as a gift. Continue on the traditions used within American quilting by making your very own Americana quilt today! This eBook wants to give quilters a quick and fun look into some of the quilt traditions that have been special enough to be handed down between quilters for centuries. Once you have downloaded the eBook and subscribed to our Piecing It Together newsletter, you will receive new free quilt patterns in your e-mail inbox every week! Join the FaveQuilts.com quilting community and gain access to hundreds of free quilt patterns and connect with quilters all over the country. 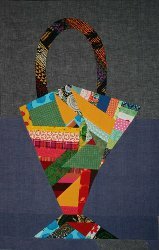 Download this free eBook and check out FaveQuilts.com for tons of quilting inspiration! What a great book with wonderful tips! Bonnie Hunter sent me to your site! Thank you. Thank you very much. Bonnie sent me here.